Many people may know, and recognize Christopher J. Farley as the Senior Editor for the Wall Street Journal, where he penned informative editorials, and conducted numerous interviews with famous actors and musicians. 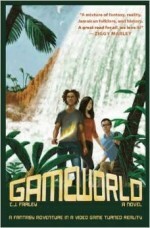 Today, we want to spotlight Mr. Farley for his work in children’s literature, as author of GAME WORLD, a middle-grade fantasy novel loaded with diverse characters and adventure! … here (finally!) is a middle-grade action novel that showcases West Indian mythology and features protagonists of color: an Afro-Caribbean boy, Hispanic-Caribbean boy who also is a wheelchair user, and a Korean girl. … Farley blends video gaming and Jamaican folklore in this intense, fast-paced middle-grade fantasy that is sure to quickly grab readers. Thank you, Christopher Farley, for your contribution to children’s literature! Huh – this looks really good, and I’m always so ready for more MG fantasy – and with West Indian mythology, which I know *nothing* about? I’m in! I am picking up this book today. I love the fact that your inspiration comes from “yahd.” You and I share our Jamaican heritage in our writings. I, too, was born in Kingston. I love to see “yahdies” contributing to the world in a positive way. Congrats on your success. One Love!